What is Joule’s Law? The Joule effect. It is known as Joule effect to the phenomenon by which if in a wire circulates an electrical current, part of the energy is transformed into heat. 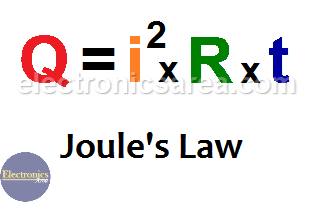 This law (Joule’s Law) is named after the British physicist James Prescott Joule. The current that flows through a wire. The heat generated by the current that flows through a wire. The time the current passes through the wire. t is the amount of time that current passes through the wire, in seconds (s). Joule’s law can be established as the amount of heat (Q) generated in a wire with resistance (R), when a current (I) passes through it for a period of time (t). The square of the current. The time the current flows through the wire. What are the heating effects caused by electric current? The resistance of the wire. Higher resistance produces more heat. The time that current flows through the wire. The greater the time, the greater the heat generated. The greater the current, the more heat generation. The incandescent bulb (also generates light). Fuse (the fuse melts, burns when the current exceeds a set limit). Thermistors: Thermistors are resistors whose resistance changes when the temperature changes. Example: How much heat does a 2 amp current generate in a wire with a 50 ohm resistor for 2 seconds? We have: I = 2 amps, R = 5 ohms, t = 2 seconds. Using the formula: J = I2 . R . t, we get: J = (2)2 x (5) x (2) = (4) (5) (2) = 40 Joules. Then: 40 Joules of heat are produced.